We have a new-born baby in the house, which means we do a lot of laundry. Also we have a new-born baby in the house which means we don't have enough sleep. Together these facts mean that we do a lot of laundry, and frequently forget to check on the machine. This project is a simple one which will facilitate sending an alarm when the washing machine finishes. 1 x WeMos Mini D1 - Approximately €2.50. 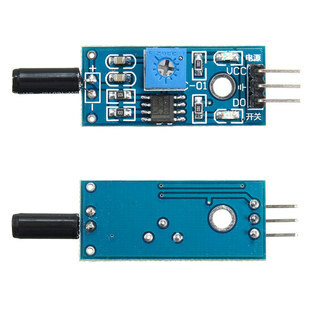 1 x Vibration sensor - Approximately €0.80. The software for this project is pretty simple it just involved a lot of patience to test. In short we sample the vibration sensor every 30 seconds, for five minutes. We read a "1" when there is a vibration, and a "0" when there is none. No vibrations were heard in the previous five minutes. This is the starting state. Vibrations were heard in the previous five minutes. In my case I regard things as "noisy" if 3, or more, of the 10 samples were showing vibration. This is the magic state which means we're done. So the code samples for five minutes, then decides what state it is in based on the previous state. If there were no vibrations over the previous five minutes - but the five minutes before that there were then we're finished, for example. Hopefully my logic is readable and correct. The software will also connect to the local WiFi network on startup, and will serve a HTTP-page showing the previous ten samples, and the current state. Every time a state-transition occurs the device will make a HTTP-call to another server which will be responsible for actually alerting when we see "FINISHED" for the first time. not. This allows the state to be updated appropriately. D1 doesn't really support HTTPS or I'd do that directly. // We work out our state by sampling ten times, once every 30 seconds. // We'll be running a HTTP-server on port 80. // Called once to set things up. // Wait until we're connected. // Called constantly to respond to things. // Last time we checked the vibration-state. // The last time we finished a laundry cycle. // If they have then we're good. // We just log this, but useful to see. // Return the response: header. // Return the response: body. // Show the state of the samples. // Should we update our sensor state? // b) it was more than 30 seconds since our last update. // Work out what state-transition to make, if any. // as the last five minutes of updates. // went from quiet to noisy? // And now we reset our monitoring state. // Is the vibration-sensor 100% quiet? // Is motion detected? We use a threshold of 3/10 periods. // Get the body of the response. // This uses some hellish String object. The asterisk denotes the current reading - so the readings above that are current, and below are from the previous 5minute interval. It might be nice to make the alerting more local - for example a buzzer could make an annoying noise, or we could play an MP3. But there was no transition back, so I've added a record of the cycle finishing - that way 30 minutes after we hit the "finished" state we revert back to the "quiet" phase. This means you no longer need to reset the device to track another cycle.